As we all know, Albert Haynesworth departed Nashville for the financially greener pastures of Washington D.C. last offseason. To some degree, most of us figured that his absence would be felt on the Titan defense in 2009. Of course, it’s hard for a unit to improve when you lose such a talented specimen who wreaked havoc against the run and pass. Welcome to the temporary home of Total Titans, late of MVN. With MVN’s impending demise, Total Titans needed a temporary home and this is it. The Seattle Seahawks, who will host the Tennessee Titans this week, are not a good team. They’re now a team with a 5-10 record on a three-game losing streak. If not for a very weak schedule, the Seahawks could easily be 2-13 right now. Two of their wins came against the cellar dwellers in their division, the St. Louis Rams. Titans fans saw how bad the Lambs were in Week Fourteen, in a 47-7 mismatch. Kevin Mawae may be best remembered because of Chris Johnson. Photo by Andrew Strickert for Total Titans. Pop quiz time. Which of the following things do you know Joe DeLamielleure for the most? A. His advocacy for retired NFL players benefits. B. He’s in the Pro Football Hall of Fame. C. He led the “Electric Company,” the o-line which turned on the juice for O. J. “the Juice” Simpson. Next weekend, the Tennessee Titans (7-8) will conclude their topsy-turvy 2009 campaign with a visit to the Emerald City to face the Seattle Seahawks (5-10). As usual, we’ll be conducting a question/answer exchange with a blogger/writer who muses about the Titans’ upcoming opponent. Have any questions you’d like to ask? Feel free to post them in the comments section below. 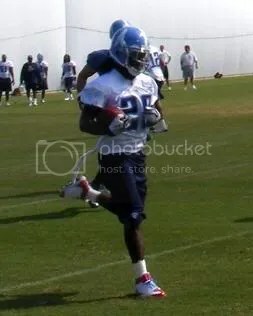 Chris Johnson speeds by the defense in the Titans 2009 training camp. Photo by Andrew Strickert for Total Titans. Now that the playoffs are no longer a possibility for the Tennessee Titans, there’s not a lot left to play for, other than records and experience for younger players. There are some prestigious and attainable single-season records that the Titans’ offense and Chris Johnson will be striving to achieve in the season finale at Seattle next week. If Johnson is able to set any of these records, they will also reflect on the rest of the team, particularly the offensive line. Hey, those are my guys and I’d love to see them get some more recognition too. For all intents and purposes, the 2009 NFL season is over for the Tennessee Titans. Marred by self-inflicted wounds in the form of back-breaking penalties and three costly turnovers, the Titans were defeated handily by the surging San Diego Chargers 42-17. Vince Young had his worst game since being re-inserted as the team’s starting QB, completing only 8 of his 21 throws for an abysmal 89 yards, while also tossing two interceptions and fumbling once. Up next…some additional thoughts on tonight’s disappointing Titan defeat. My condolences to anybody hoping to see Hood rather than the questionable, yet active Nick Harper. No starting lineup changes are listed, nor did they put Bulluck on IR and add somebody as they did with Jamie Winborn in David Thornton’s roster spot. Eric Bakhtiari is in the lineup, as I believe the Titans dress 9 DL for the first time this season. Nick Hardwick returns to the starting lineup as center, while Eric Ghiaciuc was added for G/C Scott Mruczkowski. Thanks to Ross Warner of the Chargers site Justice Is Coming for participating in this week’s Q&A session. Thanks to Scott and Andrew for suggesting questions (sorry, Scott, I didn’t get your until after I’d sent the email to Ross). Questions and answers follow beyond the jump. 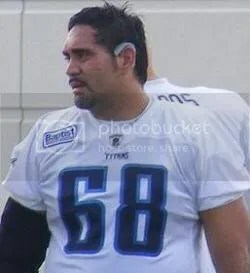 You are currently browsing the Total Titans blog archives for December, 2009.